Our high-quality crib mattresses are designed to provide the recommended firm support for your baby using only the safest materials. 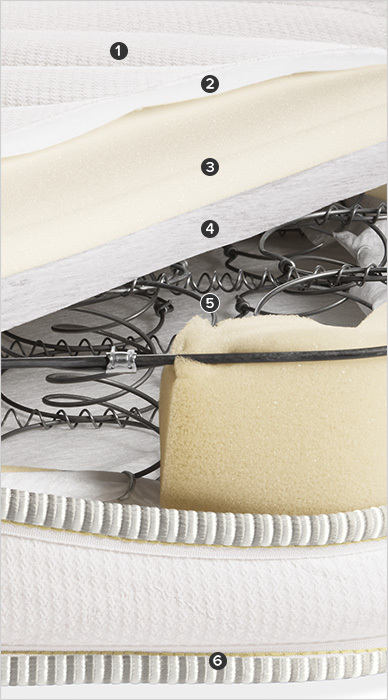 This Innerspring crib mattress has a resilient support system of connected coils made from recycled high-tensile strength wire. The comfort layers include an organic cotton cover and a non-toxic natural fire retardant fiber that is made from wood pulp and naturally resistant to flames. We also use only low-VOC CertiPUR-US® foam, which contains no flame-retardant chemicals, lead, mercury, formaldehyde or CFCs. Designed for infant and toddler use, this flippable, two-sided mattress is made to last.